Imagine your wedding on board the Patriot, being married right off of the Hooper Straight Light House or while cruising up Leeds Creek or The Wye or Miles Rivers with some of the most beautiful scenery imaginable. 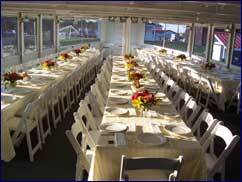 The Patriot is the Premier on water venue for your wedding and reception. We are a great, cost effective venue where you can be married by our ordained minister (op bring your own minister) on staff and then the party begins from the toasts to cutting the cake to dancing to the bands or music. The Patriot has a full sound system that can play music from an IPOD or CD or we can have a live band or DJ on board for background or dancing music. WE can provide recommendations or you can bring your favorite music, band or DJ and we will help them understand operating on the Patriot. The Patriot is fully Air Conditioned on the main deck with 2 wonderful bathrooms for your guests on board. The rear 2/3 of the upper deck is covered by canvas and can be enclosed by roll down windows to keep the party rolling regardless of the elements. Please call to discuss your special day!